Kujataa Greenland: Norse and Inuit Farming at the Edge of the Ice Cap is a cultural landscape that represents the local farming and hunting cultures adapted to life in the Arctic. The site has 5 components with features such as archaeological sites, agricultural lands and sheep farms. They include both elements belonging to the Norse Greenlandic culture, the first emigrants from Europe to settle here and introduced farming, and to the Thule Inuit culture. 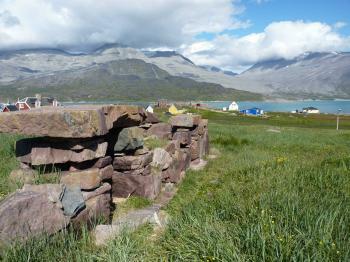 The Norse settlement of Greenland and the North American mainland remains one of history’s great “what ifs” so it was interesting to visit Bratthalid and Gardar (on the same day) during a trip in southern Greenland in 2010 and discover more about this historical cul de sac. All 3 T list sites are situated within the Norse “Eastern Settlement” – which, confusingly, was located on Greenland’s SW coast. A “Western Settlement” was further North – and a bit further West! At their greatest extent the population across both was probably only around 4000 and possibly as low as 2000. The first people arrived from Iceland in 980. The Western Settlement had been abandoned by around 1300 and the last recorded occupation of the Eastern Settlement was in 1408 – though it may have struggled on for some years thereafter. Indeed when Denmark (which merged with Norway in 1380) re-invigorated its interest in Greenland in 1721 in the form of the missionary Hans Egede, he actually hoped to find some Norse settlements and was concerned that they would still be Catholic, having “missed out” on the Protestant Reformation!! Although the settlements adopted agriculture and animal husbandry they apparently never achieved (nor sought) any degree of autonomy, cultural or physical, from Iceland/Norway, being part of a trading system whereby walrus/narwhal ivory and sealskins etc were exchanged for European necessities. Throughout these settlement years regular visits were probably being paid to the coasts of mainland N America parts of which were named as Helluland, Markland and Vinland, - indeed the Sagas indicate that the first one could have been as as early as 1000. However only the famed, UNESCO inscribed, “Anse aux Meadows” has been specifically identified as a Norse settlement – and it may have been occupied for as little as 10 years and may or may not have been the location of Leif Eriksson’s “Vinland”. In contrast the Eastern settlement was occupied for almost as long as the Americas proper have been settled by Europeans since 1492!! Gardar, located in the modern settlement of Igaliku, was the “capital” of these settlements and, as the seat of the Bishop of Greenland, contained his “Cathedral”!! I quite like the idea of the Pope in Rome appointing, over several centuries, bishops to a church in the Americas whilst not realizing what possibilities existed a relatively short distance away! The remains of this structure are clearly visible (see photo) together with a (modern) tombstone covering the exhumed grave of Olaf who was Bishop from 1246-1280. Photos and a description of the excavation can be seen in the excellent little National Museum in Nuuk (which also contains the incomparable Qilakitsoq mummies). 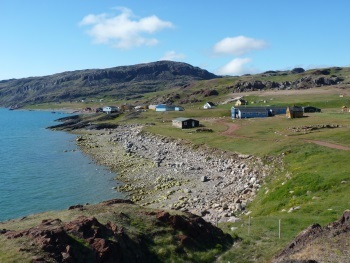 Bratthalid is situated to the north of Gardar within the modern settlement of Qassiarsuk and is something of a “tourist centre” (in Greenlandic terms anyway!) with a youth hostel, a souvenir shop/cafe and one of Greenland’s 2 international airports (though Nuuk also has summer flights to Iceland) on the other side of the iceberg dotted fjord. It was the site where Eric the Red (the first "settler")had his "estate" and a bronze statue of his son Leif Eriksson, erected in 2000 to commemorate the (approximate!) 1000th anniversary of his voyage to the American mainland from this spot, stands atop a nearby hill facing west. Local boat services enable you to explore the area – and reach Gardar. Turf/Stone outlines of various buildings which are only visible by excavation have been created over the hidden remains and include what is said to have been the very first church in the Americas. To beef up these limited remains a replica of “Þjóðhildarkirkja” has been built, together with a Norse Long house. A local (Icelandic) teacher dresses up as Norse woman and recounts (in English and at length!) the Sagas! Unfortunately I haven’t (yet!) been to Anse aux Meadows but searches on the Web seem to indicate that it too “suffers” from not actually having much authentic on show and also has to make do with reconstructions of long houses etc. But the T list entry for these sites describes them as a “Norse-Eskimo Cultural Landscape” (surely that non-PC word “Eskimo” will have to be removed!!). This indicates that the site is being marketed as more than just a few Norse ruins – rather it offers “the opportunity of tracing the evolution of the Eskimo/Greenlandic culture from the 15th and 16th centuries into the 20th century when other kinds of employment than hunting made new forms of settlement necessary”. So the description includes some Thule culture remains and emphasizes the later “fusion culture” which constitutes modern Greenland – “the settlement of Igaliku, where a Norwegian, Anders Olsen, along with his Eskimo wife Tuperna, settled as a farmer at the end of the 18th century. This marked the founding here of a Greenland farming dynasty.” The Thule culture only arrived in Greenland from Arctic Canada around the 13th century and took time to move south and eventually replace the Norse – such that the extent and nature of contacts (if any) between the Norse and Thule during their period of joint occupation is still a matter of debate. We saw Thule graves outside Igualku which had no relationship whatsoever with the (earlier!!!) Christian site. Unless you are a “Norse history” specialist the Norse remains of Greenland are only going to be of curiosity interest since there is, in all honesty, not a great deal to see and, with Anse aux Meadows having got in first, there would seem little chance of these Greenlandic Norse remains being inscribed on their own. However, if and when Greenland gets full independence, it may well have a stronger argument for a cultural site and this cultural landscape aspect might be enough to give it a chance given UNESCO’s desire to be “inclusive”. We certainly enjoyed the mix of interests – having walked past flower and grass filled meadows I can certainly understand how Greenland got its name from this area at least! I visited Brattahlid and Garder in 1974. It was incredible to discover actual ruins from the time of Erik the Red and at Garder his daughter Freydis still in existance. Amazing to think they have stood the test of time so well and one can still vividly imagine what is was like to settle there over 1,000 years ago. I never will forget the experience. Staying at Blue West One, hiking to the inland glacier, traveling down the fjord by boat, which I recall was named the Good Little Knud after Knud Rasmussen,to Narsaq, everything was marvelous. So marvelous in fact, that I later wrote a novel about all the Erikssons from the point of view of Gudrid Thorbjornsdatter yet to be published. If you like I will send you a copy. Anyway I am glad these places have become listed on the World Heritage List, along with L'anse aux Meadows in Newfoundland, another great place I have visited. Name changed from "Church ruin at Hvalsø, episcopal residence at Gardar, and Brattahlid (A Norse/Eskimo cultural landscape)"
Cathedrals: During the Norse period, from 1000- 1500 AD, Igaliku was known as Gardar and was the main seat of the church. Christianity was introduced to Greenland at the turn of the last millennium, and Greenland got its first bishop in 1124. The impressive episcopal residence Garðar was established shortly afterwards in Igaliku. A cathedral was built, and was the biggest church in Greenland in the Middle Ages.